I found this ad while leafing through a January 1981 National Geographic with an awesome feature on the Mount St. Helens eruption. To the dismay of many of our readers, I actually did not know Chevy Monte Carlo ever came with a turbo option. For one thing, I thought boosted V6s were exclusively Buick’s speciality (other than 1989’s Trans Am turbo) and for another, with only 3,027 sold for 1981, such cars can fairly be called obscure. On the other hand, I shouldn’t have been surprised when GM surely needed to spread the costs of developing the forced-induction 3.8 and restricting it to only one division wouldn’t be the most sensible option. Let’s explore this short-lived wonder a bit more, shall we? The Monte Carlo turbo was actually added to the line up the in 1980. 13,839 of these were sold, making them a lot more common than the restyled 1981 featured in the ad above. Other engines for 1981 included a 229 CID (3.8 liter) Chevy V6, a 231 (3.8 liter) Buick V6 (for California), a 267 (4.4 liter) Chevy V8 and a Chevy 305. With 170 horsepower and 275 lb-ft of torque to the 305’s 155 and 240, the turbocharged 3.8 Buick V6 mostly distinguished itself with reportedly marked lag and similar real-world economy. News of the disappointment apparently spread rapidly resulting in a pronounced sophomore slump. This, despite the addition of computer control and a lock-up torque convertor for the turbo’s second sales season. The turbo was gone for 1982, though the Monte Carlo did get a 4.3 liter diesel V6 and 5.7 diesel V8 as “compensation.” Both would be gone by 1985. Chevrolet offered the turbo V6 on both trim levels, but did not offer a performance package as Buick did. The Monte Carlo was meant to conform to a very conventional understanding of elegance and as such, could not be ordered with such vulgar touches as a tachometer or boost gauge, even when equipped with F41 suspension and the optional gauge package, which added a water temp gauge and giant clock, à la Jetta diesel. The Regal, on the other hand, benefited from an options package which added a lower (numerically higher) rear axle ratio, higher-stall torque converter and dual exhausts–all of which aided low speed response and added five horsepower to the upper midrange where the turbo really proved itself against the Chevy 305. Chevy would abandon forced induction as well as formal styling for the Monte Carlo, going for a more old school muscle car approach with 1983’s SS, but Buick stuck with the turbo 3.8 and refined it considerably over the next few years. As it turned out, the biggest potential it offered was not in increased economy as much as increased performance. This is a seemingly forgotten lesson today, with the newest crop of small displacement, forced induction engines often providing disappointing real-world fuel economy but formidable performance (I’m looking at you, Ford EcoBoost) or decent torque and economy but middling performance (GM’s soon-to-be-replaced 1.4 turbo). Had Chevy hung on until a proper multi-point fuel injection system was offered (beginning in 1984), the SS might’ve been a very different car. Ironically, it was Buick’s quest for improved economy and emissions which ultimately and unquestionably gave them the fastest of the sport-oriented G-body coupes. I think the Monte Carlo SS has the best looking nose, better looking than the rest of the Monte Carlo line. While improved, the second generation BOP versions were all still better looking. For what the Monte Carlo SS might have promised in appearance, it’s a shame that GM couldn’t figure out a way to get the 350 into the engine compartment instead of the lame 305. It was so weak in comparison to the Buick (and even Olds’ 307), it got a 7.5″ rear axle carrier instead of the others’ 8.5″. A 350 SS might have gone a long way to evening the score with the hot turbo V6 in the Grand National. The 305 in the SS was hardly lame and was not the same engine as the lower output LG4 as used in the regular cars as an option. For starters the Monte SS’s 305 was an L69 motor with a beefier block, performance cam and valve springs and a higher redline. It made 180 HP instead of 150 and came hitched to 3.42 rear gears with the 3 speed THM 350 transmission or 3.73 gears on the 200R-4 transmission and reduced 0-60 times from 9.5-10 seconds to around 7.8 which was not far behind the 200 HP SFI Buick 3.8 turbo introduced in 1984. The 1981 turbo Monte saw a change in rear gears from 2.41 to 2.73 to help performance some and of course adopted the GM computer controlled C3 emission system which helped mileage a little. It’s also worth noting that the 1980 Monte Carlo came std with the larger steel belted 205/70R14 tires and a rear sway bar and HD springs and shocks were optional as apposed to the 1981 car which lost the rear sway bar and went with the same 195/75 tires as the rest of the basic G-body cars. I have driven a few 1981 turbo Montes in the day and one had to pay real close attention to using high test gas to get any zip out of them. Although I’d agree with you that a GN was quicker than a Monte SS, the L69 305 Monte Carlo SS could easily wipe the floor of a Olds H/O or 442 with the HO 307. Heck, once they bumped the compression on the base LG4 in 1985, I bet LG4 305 car could give a 307 HO a run for its money. The Monte SS also used the 7.625″ rear (same as F-bodies), while the 442, H/O and the GN’s used 8.5″. All other A/G-bodies used 7.5″ rears. Even my old ’85 Delta 88 with a 307 had a 7.5″ rear. I completely agree with all of this. The ’81 Monte restyle still looks good today, especially with those awesome “checkered flag” wheels shown on the car in the ad. The SS’s nose seemed to give it a completely different identity than the other, luxury-oriented models. I would take either. I LOVE old Motorweek episodes…great memories! Thanks for including one in your article. Yep Motorweek is a Maryland institution and to this day, I still think it is somewhat better the current Top Gear (which I love also) because it was not a program devoted to supercars. Sure they had high dollar cars on the show but a great majority of the cars shown were affordable and the average Joe could get into because you could go into a showroom and test drive and buy one without selling a kidney or first born child. Shoot, I wasn’t aware there was a Chevy V6! Wiki says it was dimensioned based on the SBC, for obvious reasons. Of course it had to be about the same size (in L) as the Buick, to maximize customer confusion. It might’ve been clearer to cite in³ instead. The Buick V6 should’ve been called the Gallon V6 since that’s exactly what it displaced. This is how I remember how many in³ are in a US gallon. Historical trivia: The US Gallon is the old British wine gallon, as opposed to the Imperial Gallon, which is about 10lbs of distilled water (a nod to the metric system). I ALSO use the Buick V6 as a mnemonic device to remember a gallon’s capacity: twins! I’ll add CID to the 3.8. Sorry, I meant to complain about GM, not your interesting writeup. Ford’s being very late to the V6 party was a big disadvantage in the compact market; look at the power ratings of Ford’s pathetic inline sixes compared to Buick & Chevy V6s. These would’ve done wonders for the Fox bodies, for example, and been a better fit for the Mustang. There were Ford V6s in Europe in the 60s,I had a 68 Zephyr 6 (2.5 litre).I’m guessing that “Not invented here” was the reason Ford America was late to the V6 game. Too right; my friend’s family had a 2½ ton ’71 LTD, which despite the name, didn’t have front discs & vacuum assist as standard. This in Calif., which has pretty long ~6% grades such as the I-5 Grapevine, & where engine braking is problematic with large automatics like the C6. Even “primitive” MG had std. front discs by 1961. Maybe Americans believed only cowards needed good brakes (Jerry Reed lyric: “Never mind them brakes”). Just of out curiosity, I checked at the Old Car Manual Project – the 1971 LTD did have power front-disc brakes as standard equipment. But the Custom 500 and Galaxie 500 models came equipped with manual drum brakes as standard equipment! Interestingly, starting in 1971, all full-size Chevrolets came equipped with power front-disc brakes as standard equipment. When the Cologne and Essex V engines were first introduced, Ford had a family of smaller inline sixes (the 144/170/200, or if you will 2.3/2.8/3.3 liters) of very recent design and no particular reason to need a six that would be more physically compact. (The Falcon and Comet were designed for an inline six.) When Ford started having smaller compacts in the ’70s, they adopted V-6 engines, but decided it was cheaper to import the Cologne than to tool up for another engine family in the U.S.
Perhaps so. I didn’t mean to overlook the Europe versions, but that Ford would replace the Köln V6 with the inferior Falcon six in the Mustang tells me that production logistics was their overriding concern. “Gallon”-sized V6s (perhaps based on the venerable 302 block) would’ve been more useful across their domestic product range, & would’ve made the tooling worthwhile. The 4.0 Köln was common in their later mini trucks & minivans, but by this time they finally had the Vulcan V6 for their FWD models. Ford had exceedingly fine straight six motors and the worst v6 motors ever made…back in the day. Ford would have been better off having never ever tried to make a V6 motor. Yep, both 3.8, and as Perry mentioned in the article, both available in the Monte Carlo (and the Malibu for that matter). I had an ’82 Malibu with the 229 Chevy V6 and found it to be pretty underwhelming. Slow, not super refined, and mediocre at best gas mileage. Also it was only happy on 89 octane gas (though the previous owner may have messed with the timing). 200 cubic inches (3.3 liters), built from 1978-79, essentially a 6-cylinder version of the 267 V8, used only in A-bodies. The A-bodies had to switch to V6s when they were downsized in 1978 because their engine compartment wasn’t long enough to comfortably fit a straight six. The B-, F- and X-bodies kept the 250 cubic inch straight six until 1979. Trucks/vans/SUVs would keep the 250 until 1984. 229 cubic inches (3.8 liters), built from 1980-84, essentially a 6-cylinder version of the 305 V8, used in A/G-, B-, and (pre-1982) F-bodies. 262 cubic inches (4.3 liters), built from 1985-90 in cars and 1985-2014 in trucks, essentially a 6-cylinder version of the 350 V8, used in B- and G-body cars and a wide variety of GM trucks, vans and SUVs. While there were some exceptions (the 1980-81 Turbo Monte Carlo that is the subject of this post being one example), Chevy for the most part used its own V6s in RWD vehicles, not the Buick V6. Conversely, the B-O-P divisions mostly used the Buick V6 for RWD applications, not Chevy’s (again, there were a few exceptions). For some reason, the 200 and 229 were never able to pass emissions in areas with stricter than normal standards, e.g., California. Chevy used the Buick 231 in those areas as a substitute. That was Chevy’s biggest use of the 231. –The use of the 231 in certain areas (e.g., California) where the 1978-84 200 and 229 wouldn’t pass emissions. –The 1980-81 Turbo Monte Carlo that is the subject of this article. –I believe that some fourth-generation Camaros (1990s-2000s) used a 3.8-liter V6 which I’m assuming was part of the 3.8L Buick family, although by that time the concept of divisional engines had mostly fallen by the wayside. –IINM, I’ve seen sources indicating that the 1980 Pontiac LeMans — just the ’80 LeMans, not LeManses from other years, not other ’80 Pontiacs — used the Chevy 229 (except in special emissions areas, of course, where it got the 231 instead). I have no idea why. –The third-generation Pontiac Firebird (1982-92) used Chevy V6s shared with the Camaro, although they were from a completely different family of V6s from other RWD cars. –Towards the end of their runs, I believe that the B-body Pontiac Parisienne and G-body Pontiac Grand Prix switched from the Buick 3.8 to the Chevy 4.3. –The 1991-2001 Oldsmobile Bravada SUV used the Chevy 4.3L V6, shared with Chevy (and GMC) trucks/SUVs built off of the same design. The 1993 to 95 Camaro and Firebird both used the 3.4 L32 V6 as their base engine, though I’m not sure who that one “belonged” to. As far as I can tell that engine was only used in the F-bodies so it may be a special case anyway. I also had a Malibu with the 229 V6 (it was a 1980) and it was pretty gutless and did not get the best MPGs. It also only played nice with midgrade gas(89) if it got regular(87) it pinged and tossed a fit. I have a 3.8l engined 1985 Cutlass and it is pretty gutless also. Note that Ford too got in on the 3.8 V6 act starting in 1982 with there not so good Essex 3.8 aluminum head engine with nylon rocker covers and was basically a reversed engineered Buick 231 V6 in many ways right down to the external oil pump. Power was 112 HP and torque was 175 which was comparable to Chevy’s 229 introduced in 1980 that started off with 115 Hp and 175 torque and Buick’s 231 V6 which made 110 Hp and 190 torque from 1980-1987 in 2BBL form. IMO none of these 3 engines are particularly good for various reasons and I have either owned or driven many examples of each including a rare 1982 Granada wagon that ran smooth but was rather gutless and a 1983 T-bird that felt a tad better but was hardly noteworthy. The 1984 on up Central fuel injected versions were better, especially when hitched to the optional 4 speed transmission with required 3.27 gears in cars like the T-Bird and Cougar. Don’t feel bad, Perry – I don’t think I ever knew this existed either. Looking back, there seem to have been a lot of very bad turbo engines in the early 1980s. The Ford Mustang/Fairmont version of around 1980 or so joins the Pontiac unit as obscure and troublesome. This is one area where Chrysler really did get the quality right when it started pushing the turbo on the 2.2. And how clueless. 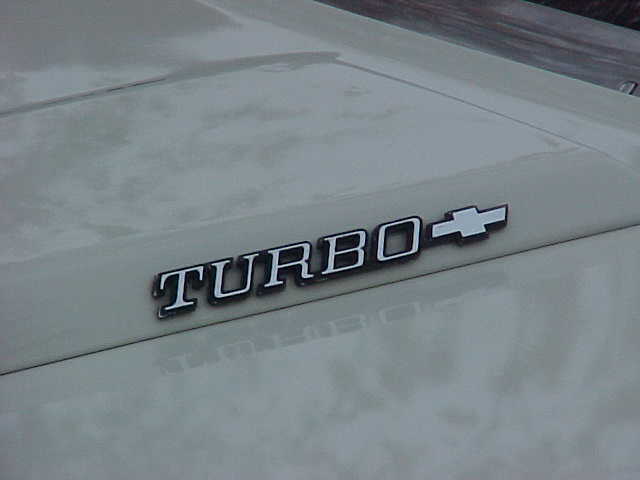 Everyone in the developed world equated “turbo” with fast or at least sporty. But not Chevy – let’s just stick it in a regular car. Chrysler would do the same thing in a few years, but for the same reason Studebaker put superchargers on Hawks in the late 50s – because that was the only way they could afford to put any power in the cars. Chevrolet did not have that problem. I wonder if Chrysler turned to Mitsubishi for input in regards to their initial turbocharged 2.2? By then, Mitsubishi had already introduced turbocharged versions of their Sirius, Astron, and Orion engines. I had a 1989 LeBaron with the 2.5 Turbo I, and the turbocharger itself was a Mitsubishi unit. I wonder if the turbo models were a way to keep V8 sales figures below CAFE penalties? Of course they were. Same reason there are so many turbo 4 engines making > 200 horsepower on the market right now. Gives respectable power figures without the economy penalty of a bigger-displacement motor, in exchange for some added complexity (and arguably shorter engine life, but as long as it outlasts 100K or so, I don’t think they care all that much). This is certainly on my mind as I contemplate the purchase of an Eco-Boost equipped Ford vehicle. It is too early to know if an Eco-Boost will last the 200K I expect from a modern engine. The latest ecoboost motor has the durability of a diesel engine. diesels have turbos running very high boost and all you will ever hear about them is how they last 2-3 times as long as a normally aspirated gasoline engine making half the power. I never thought turbocharging or supercharging was the way to go for anything but a race car. I prefer to make power the good old fashioned way, with cubic inches. And for some reason, cars with forced induction never seem to hold up as well as their normally aspirated counterparts. I can see that if someone just bolts a turbo or supercharger on a stock engine, but if it came from the factory that way, they should have built the engine strong enough to hold up under the power it makes. 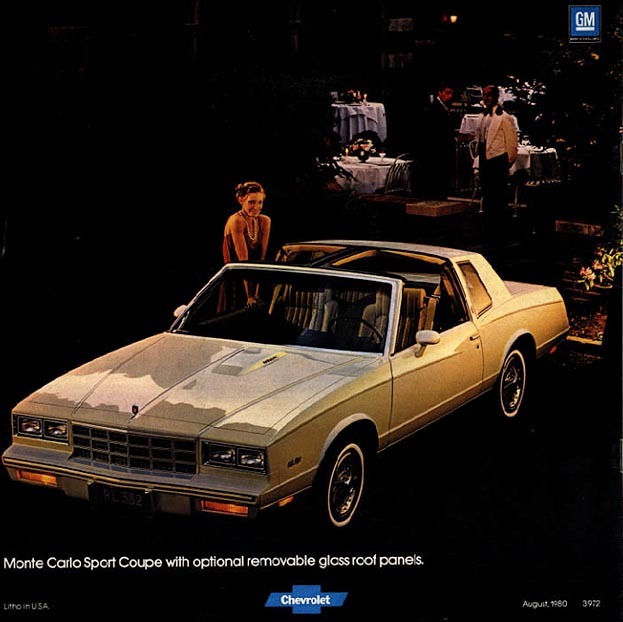 I absolutely hate the looks of the ’78-’80 Monte Carlo. It looks like they took a full sized car and shrunk it, which is probably because that is what they did. The 1981-1988 fourth generation looked WAY better, especially the SS model. For me, ’88 is where the Monte Carlo ended. I like the first, second, and fourth generation models, but the round headlight versions of the second generation will always be my favorites. Class 8 diesel engines run a million miles with 3 atmospheres of boost while running at or near 100% of rated power output continuously. I really liked the restyle of the ’81 Monte, it was a vast improvement from the ’78-80 versions. Don’t think I would have wanted the turbo though, too expensive to fix if it ever had problems. This style of wheel as shown in the first advertisement is one of the best ever! I agree, that is one cool-looking wheel. This article reminds me that a friend in HS had a 1980 Monte Carlo Turbo…with two-tone paint and wire wheel covers! I love those “checkerboard” alloys too. Rare though, I think they were only offered for a couple of years. There is an early 80’s Monte which appeared recently in my neighborhood that has them–need to take a closer look at that car and see if it might be a turbo (and even if not get some photos). I was about to post the same thing. A very goodlooking option second only to Buick’s turbine wheels of the same time period, they should bring them back. . Maybe we need a CC on vintage wheels! I remember seeing these come off the assembly line in Fremont. It seemed strange that the car didn’t present itself as a performance car. It was like the Chrysler cars where the turbo was just there to provide a little extra power. I agree that Chevy saw itself as the “V “engine powered division, still no one knew what the future would bring. The experience would come in handy. Those cool checkerboard and spiral wheels were “Polycast”. A standard steel wheel with a molded plastic face attached. They were pretty common on the assembly line but I haven’t seen any on the street lately. Overall I like the looks of this generation MC especially the SS version. I like the g body. But the grand prix looked best in my eyes. My favorite year is 1985 of the grand prix. The best wheel is the wire wheel cover. The 1981 monte Carlo looks sharp to. 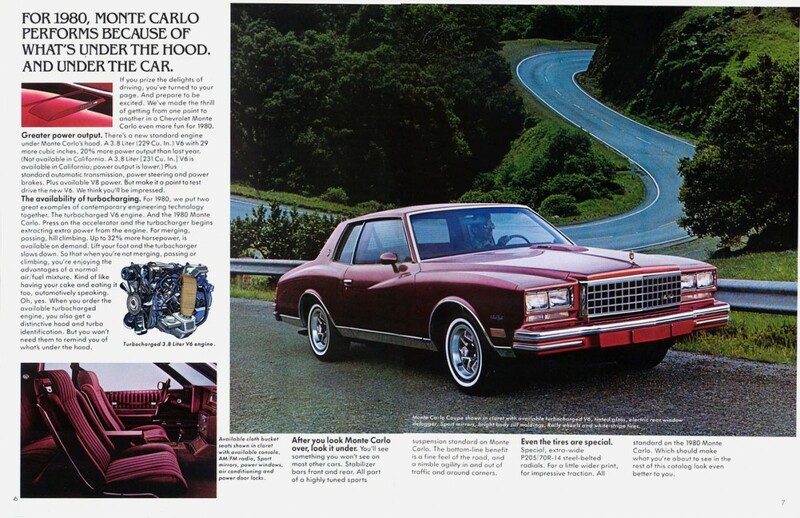 Thanks for another car I’d never heard of,I knew of the Buick turbo’s and the Pontiac F body but had no idea there was a Chevy Monte Carlo turbo.In 1981 the only new American cars that interested me were the F bodies which I preferred over the Mustang despite being a Ford fan. One of the secretaries at work had a Turbo Monte Carlo. She has issues with the engine that the dealership could never resolve. Finally, she found a mechanic from a professional drag strip team who tamed the beast and made the car run faster than a cheetah. Unfortunately, her son also enjoyed the new found power and ended up wrecking the car. I had forgotten about the Turbo option on these Monte Carlos. I just remember thinking that the downsized 1978 Monte Carlo was by far the least attractive of GM’s new intermediates that year. Adding quad headlights for 1980 only made it more awkward (while adding quad headlights to the 1980 Oldsmobile Cutlass Supreme and Buick Regal improved their looks). The 1981 Monte Carlo was a major improvement in the looks department. I still think these cars were pretty well designed, except for engine performance. The size of this era’s body was brought down to a reasonable size and the cars looked good. The emission controls and fuel induction were still primitive and suffocated performance. To me, it seems like someone at GM was at least trying to correct the lack of performance by introducing the turbo to some of the lineup. Although the G-bodys were never available with anything larger than a 350, it is silly easy to fit a 454 under the hood. I remember these, even though they were a flop. Chevy acted as if the motor was forced on them, and really were the ‘small block V8’ brand, and care. Car and Driver tested one and rated it poorly. 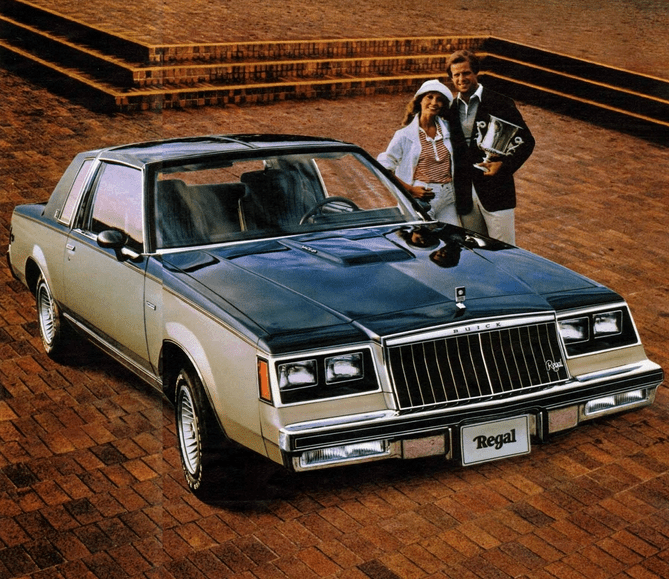 But, while the Turbo Regal was on sale, Buick was aiming for a ‘Euro-Sporty’ image. [Never mind the Celebrity Eurosport]. The GN and GNX were the peak. 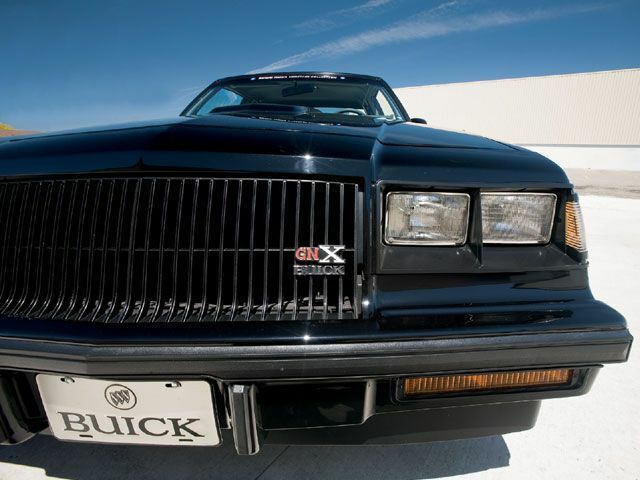 But as soon as the RWD G body was put down, GM HQ decided Buick should be ‘traditional’, i.e. ‘eldery appealing’. So, then it got its ‘old folks’ image that it’s still trying to shake today with “Is that a Buick?” ads. I remember ONE Monte Carlo Turbo in Ottawa, OH that I finally became aware of in the early 1990s. It had been decently taken care of but had a small amount of rust that seemed to affect all G-bodys. It was painted a deep midnight blue and had the wheels shown in the national geographic ad. I wonder if it was special ordered or if it was the ONE turbo Monte Carlo disbursed to the local Chevy dealer? I’m surprised to see the turbo V6 version has better gas mileage than the regular V6 engine on the highway, I thought the 1983-88 Monte Carlo SS was the best looking of the 1978-88 Monte Carlo’s, for the regular Monte Carlo’s I thought the original 1978-79 were the best looking (hated the 1980 front end), is it just me or did the Euro headlights look out of place on the 1987-88 Monte Carlo’s. Believe it not the turbo 3.8 was upgraded to the Buick spec 2.73 gear for 1981 along with the C3 emission’s system and lockup torque converter. The base 3.8 Chevy 229 V6 came with the lower 2.41 gear along with the other upgrades including higher pressure tires so it’s lower mileage rating is odd especially when you consider Buick was advertising up to 30 highway with there NA 3.8 this same year. I owned a 1981 Cutlass with the 231 V6 and it never ever came close to 30 highway more like 26-26.5. My buddy owned a 1984 Monte Carlo with the Chevy 229 and 2.41 gears and got the same mileage as me for the most part so Buick’s higher mileage claims would appear to be suspect in real world driving from our results. When I lived in northern Ca. 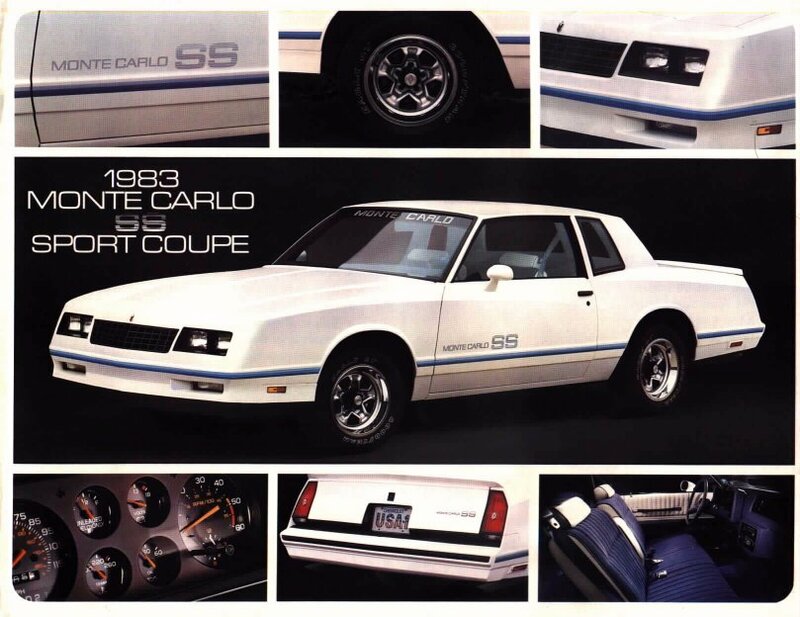 in the very early 80s I remember seeing at least 1 or 2 turbo Monte Carlos on dealer’s new car lots. I was of the opinion that it was a shame to have what I thought was a performance engine in a wannabe luxury coupe. Apparently Chevy brass didn’t want folks associating performance with anything other than a (Chevy) V8, either. Why have all those “holes” in an instrument panel….and only fill them with a clock? That kind of thinking was a small reason why I traded my 78 Nova for an 80 Fiesta. Sorry, Perry, but Buick did not have an exclusive on turbo technology at GM. In 1980-81, there was the Firebird Turbo 301 which was offered in the T/A and Formula models, to replace the lost big-block motors. I’m guessing he meant the turbocharged V-6, specifically. I think this is a wording issue rather than one of ignorance. worked at family Chevrolet dealership at the time. This is the first I have ever heard of a Turbo Monte Carlo. 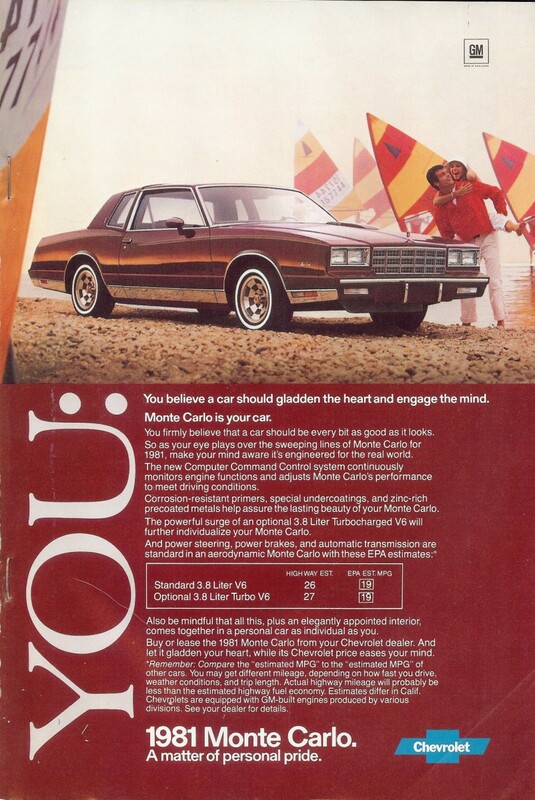 I have a couple questions: On the first ad, for the 1981 Montecarlo, do you know if the sunset reflection on the side of the car was airbrushed? For instance, the Regal ad… The car looks so weird, like it was pasted over the picture. It would be cool if some reader that knows more about what was real and not on old car ads could write something for CCs. Yeah I noticed that about the Regal pic too. Something’s off there. The Monte Carlo ad is a particularly bad airbrush at that. The sailboard on the right casts a shadow toward the car, so why would there be reflection of light from the sun on the passenger side of the car? Yes, that’s odd. I didn’t analise it as you did, but that might have been why I noticed the fake airbrushing in the first place. Dang! Those are very rare cars. I have never seen a turbo Monte Carlo or one with T-Tops, ever! Even here in Soak-Cal! I did see an orange 1974 Honda Civic in pristine condition, sadly it got away doing a right turn while I was in the middle lane to take a pic of it. I don’t know how rare the Black Buick Grand National cars from the mid to late 80’s are, but I have seen tons here in So-Cal. A friend had bought an immaculate used 80 turbo Monte used in 82 – 2-toned light camel metallic/beige – what a dud – we called it the Turbo Turkey – he traded it off after a year or 2.
and lower rear gears…these cars will suprise you. Turbo, non turbo, slow, or fast, I love the 78-87 A/G bodies. Should have bought several when they were $800 cars. Now I can’t afford them.